Fits XL100C, XL-8300, XL888, XL5000, XL5300, XL8000, XL9000, XL9200, XL9200SG and XL2000 series, Without docking system. 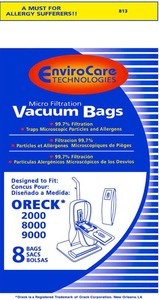 These Oreck bags are an aftermarket made by Envirocare Technologies # 813. Envirocare Micro Filtration Bags trap microscopic particles and allergens with 99.7% filtration. Their are 8 Micro Filtration disposable dust bags per package. Replaces Oreck OEM bag # PK800025.